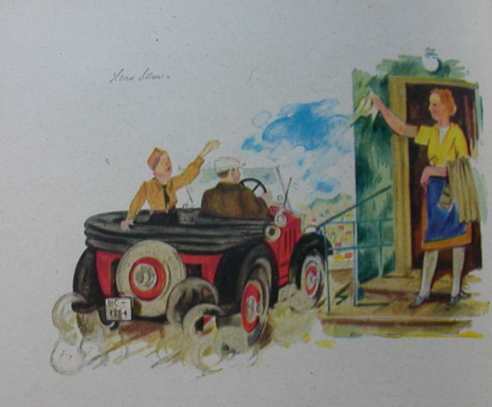 Background: This page contains translations and illustrations from an elementary school reading textbook, published in 1941. The propaganda content, even for young children, is strong. Parts of a similar reader are also available. 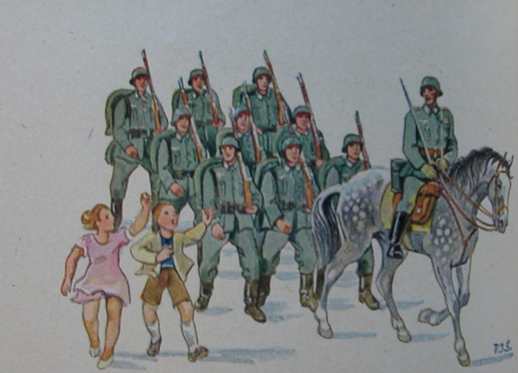 The source: Fibel für die Volksschulen Württembergs (Stuttgart: Verlag der Union Deutsche Verlagsgesellschaft, 1941). That is our neighbor with his car. Albert may go along. His aunt is getting his coat. But Auntie, I don’t need it! It is so warm! The neighbor laughs. The motor rattles. Heil Hitler! The auto is gone, far, far away. Bye-bye! 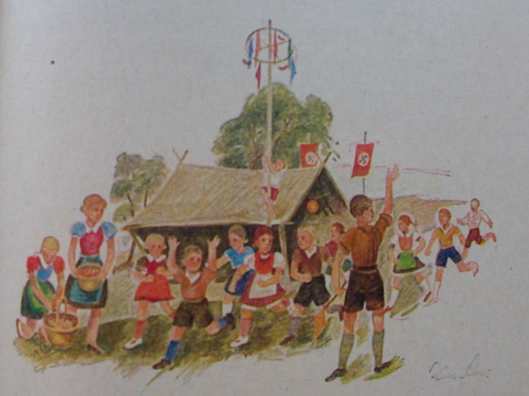 [The story has a picture of Hitler meeting three children.] He was born on 20 April. Adolf Hitler had a birthday. He did not stay in Berlin, however. He flew far in an airplane. Do you see the quiet forest and high mountains behind him? Here he has a house. That is where he celebrated his birthday. Elfe, Hilde, and Siegfried knew it. They went to him and gave him a bouquet of flowers. That pleased him. Today things are happening on the sports field, Karl said to his mother. I am going to get a prize. His mother laughed: Hey, you little guy, you are still too small! But Karl went out the door. He came to the school house. 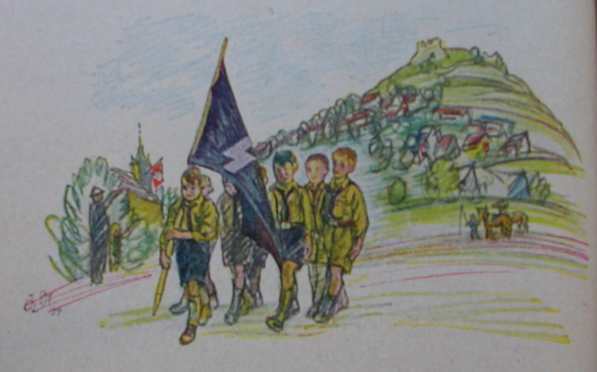 There the Hitler Youth and the Jungvolk [the organization for boys aged 10-14] were standing there, along with the big and little girls. Karl wanted to join his brother Alfred in the ranks and march with them. But he was too little. He had to leave. He cried, but not for long. The command came: March! The flag and banners were in front. Everyone sang a song. Karl marched behind all by himself and sang along. Music was playing at the field. The big boys and girls did gymnastics, races, and games. Karl thought: If only I were older! Suddenly someone shouted: Attention! The little kids can have a race! Line up here! There is the goal! One, two, go! Karl was the first. He got a sausage and a pretzel. He laughed heartily. When he came home, his mother asked: Where is your prize? Karl answered: I ate it. Karl is participating in the summer solstice for the first time. He is standing right next to the wood pile. 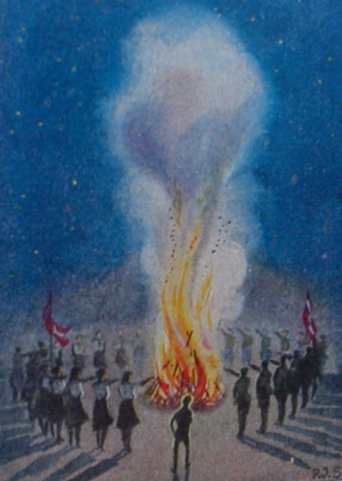 With wide eyes, he looked into the yellow fire, which glows red into the night. The flames devour the dry wood, the sticks, the old boards, and the beams. The air gets hot. Breathing is hard. Smoke gets in the eyes. Sparks jump into the air. The flames shine brightly on the boys and girls. They raise their hands and sing a song. Kurt thinks of the sun. His father said: The fire comes from the sun. The sun is the mother of fire. That was a pleasure. I was beside myself. To be able to see the Führer! Will I be able to get close to him? Will he say something to me? Will he ask me something? I had a hundred questions for father and mother. It was a long way. Always uphill, higher and higher. Many were on the same path.Men and women, children and old ladies. Finally we reached the Haus Wachenfeld. How beautiful! But one cannot go into the house. There is a fence. And SS men guard it. We looked around at the splendid view. Then the door opened. The Führer came out. Everyone stretched out their arms. Everyone shouted: Heil! Heil! Heil! The Führer came closer and closer. He talked with people. Now he is by a very old lady. She wanted to see the Führer, too. Now he came by us. I trembled a little. I no longer know if it was from joy or fear. I gave the Führer the flowers. He ran his fingers through my hair and patted me on the back. He laughed in a friendly way, and his eyes shone. I no longer had any fear. Loudly and clearly, I told him. He smiled at my parents, too. I looked around. My mother had tears in her eyes. I will never forget the day. We talk about it often at home.